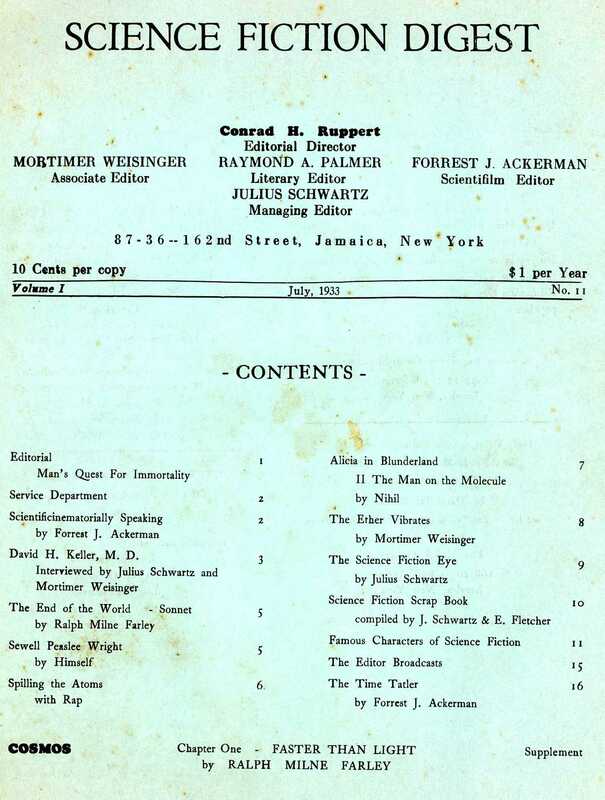 The first installment of Cosmos arrived with the July, 1933 issue of Science Fiction Digest, a small pamphlet tucked inside the back cover and stapled to the rest of the pages. The excitement among the editorial staff bubbled over on almost every page of the issue. The editors spoke of the novel as though it had already been written, while it’s likely that only the first two chapters had been completed. Read the first great episode of this remarkable masterpiece in this issue. Watch next month for Dr. Keller’s great second chapter. You won’t want to miss a single thrilling episode of this great novel. Sixteen of Science Fiction’s foremost authors combined their talents in order to bring this novel to our readers. In “The Editor Broadcasts” (pg 15 – 16), the first reader letters referring to the serial appeared. “Last winter, as you know, you sent me a circular containing the advertisement of a story by A. Merritt. I thought I would try your mag out, and I did beginning with the February issue. Am I sorry? Not at all. “Your June issue is very interesting. The only adverse comment which I have to make is about the gossip columns. “They are the best part of the magazine, potentially. Julius Schwartz’s newsy items are very good, but their high quality is more than counterbalanced by Weisinger’s scandal column. I am glad to notice his scandal has been discontinued in this issue. Palmer, though he no longer does gossip columns, is as interesting as ever. “I wish to congratulate you heartily upon the forthcoming Cosmos. According to all indications, it will be one of the best stories ever written. But, why, why, why didn’t you get Campbell to do something. Of course you have got Edward E. Smith, who is, next to Campbell, the best. Mr. Jaffe is our first reader to complain about Weisinger’s column. What do other readers think on the subject? 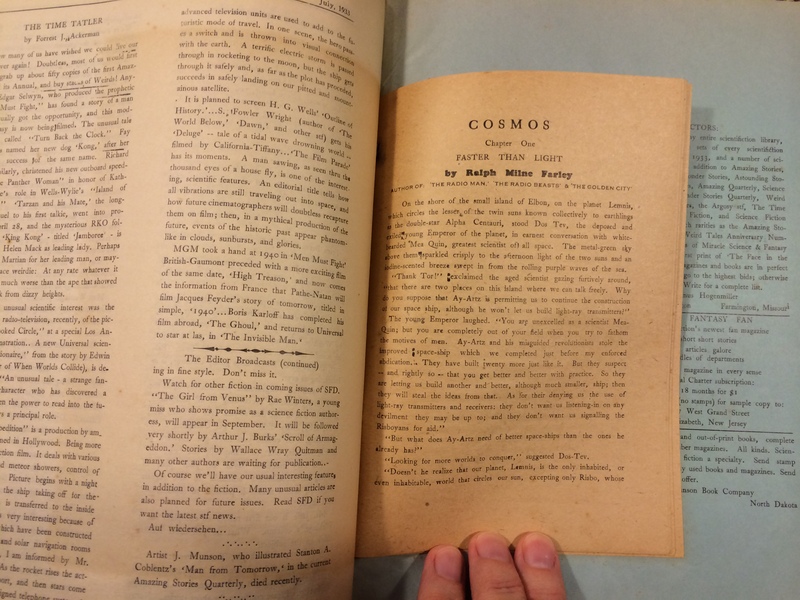 How do you like the way COSMOS is bound with this issue? All you have to do in order to get a fine book is take out the staples which hold SFD together, remove the supplement, and when you have saved every episode they can be attractively bound. You’ll then have a real classic to add to you library. 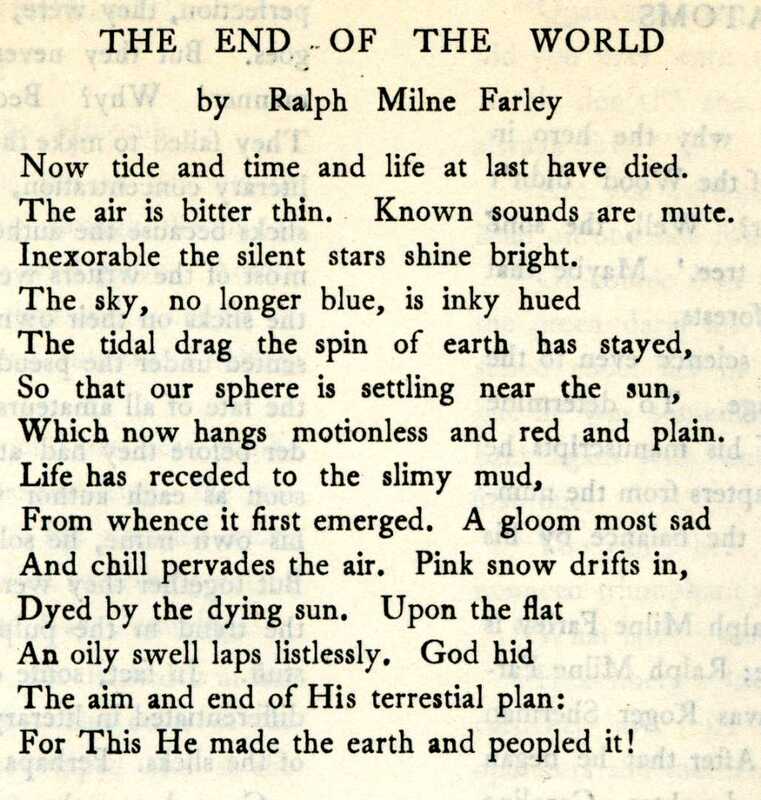 This issue also featured a rather gloomy poem by the author of the first Cosmos chapter, Ralph Milne Farley. It was very common for the sci-fi and fantasy authors of the day to write both prose and poetry, a practice that seems very uncommon today. 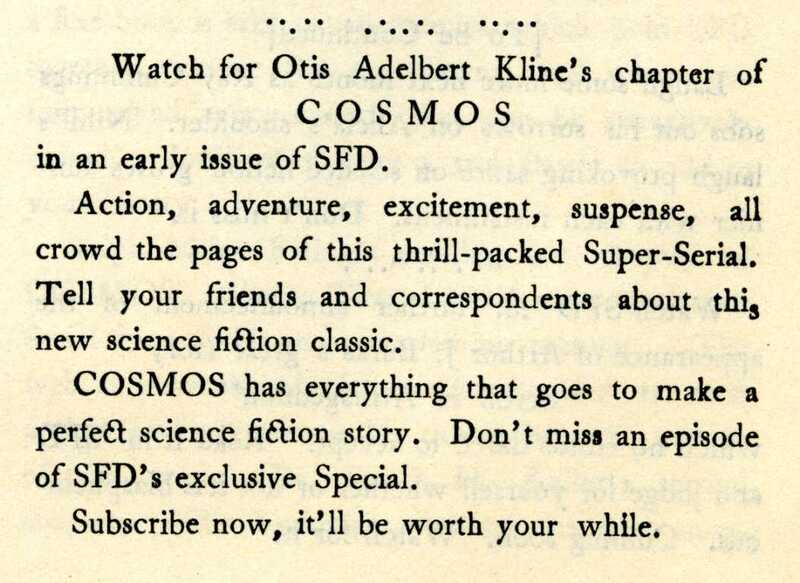 Read the first chapter of COSMOS.